Advances in refractive surgery have made it a possible option for many patients who want an alternative to eyeglasses or contact lenses. Radial Keratotomy was the first commonly practiced and known refractive surgery for correcting shortsightedness. Radial Keratotomy was pioneered by a group of Russian ophthalmologists in 1970’s, who improved upon the techniques first described by the Dutch ophthalmologist Lendert Jan Lans in 1896 and the Japanese ophthalmologist Sato in the late 1930’s. Since then Radial Keratotomy has been widely performed throughout the world. This operation was the earliest refractive surgery procedure widely performed in the United States for the correction of shortsightedness. The early popularity of this procedure led to the progress of refractive surgery as a way to decrease or eliminate the need for spectacles or contacts. However, the popularity of Radial Keratotomy has declined since the introduction of excimer laser vision correction procedures such as Photorefractive keratectomy (PRK) and LASIK (due to superior predictability and stability). If you are younger than 20 years you should not have the procedure performed because your refraction may not be stable. Radial Keratotomy can be used to correct myopia from -0.5 to -8.0 D. However in practice it is effective in correction of low to moderate myopia up to -4.00 D before disturbing visual symptoms interfere with the refractive correction outcome. How Radial Keratotomy is performed? Radial Keratotomy is an outpatient refractive surgery procedure. It is done under local anesthesia in a surgeon's office or a same-day surgery center. Before surgery, precise measurements of your cornea are taken to determine its thickness using a special device called Pachymeter. Just before surgery, a number of eye drops will be placed in the eye to be treated. These eye drops will anesthetize the eye and prevent infection. You will lie down in a bed during the surgery. A special solution is used to clean around your eyes. Your surgeon will instruct you to fixate on a target. An eyelid holder (speculum) is used to hold your eyelids wide open. Ink marks are made with a marker to outline the optical zone, which is the clear, unincised area of central cornea. Then your surgeon will make a series of tiny radial or spoke-like incisions in the surface of your cornea with a special diamond-tipped knife set to a particular depth. The incisions generally go 90% of the corneal thickness as determined by your pachymetry. The number of incisions varies with age and degree of refractive error. Commonly, four or eight radial incisions are created, depending on the amount of correction needed. Recovery is generally rapid, with only mild discomfort. You may return to your usual activities within a few days. 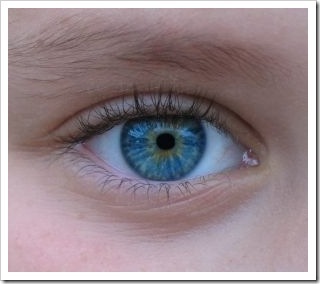 How Radial Keratotomy Corrects Myopia? The radial incisions created in the cornea produce a bulge in the peripheral portion of the cornea and thus flatten the central portion of the cornea. By varying the length and number of incisions created, the surgeon controls the amount of correction produced. As the incisions heal after surgery, the cornea becomes permanently flatter. This corrects myopia by moving the focal point of the eye closer to the retina and improves your distance vision. Reoperations (enhancements) might be required to improve the surgery result. Glare and starbursts are common in the first three to six months after surgery, especially at night. Occasional Vision Instability: It is not uncommon for Radial Keratotomy patients to be relatively farsighted in the morning and more nearsighted by evening. The fluctuations increase with higher corrections. Overcorrection: change from nearsighted to farsighted after surgery. Undercorrection: still nearsighted after surgery. It occurs more frequently in higher myopes. Hyperopic shift; some eyes become significantly farsighted in future years. Over time, progressive hyperopia has become a less common occurrence. Irregular astigmatism that causes decreased best-corrected visual acuity, ghost images or double vision. Inability to wear contact lenses because of the new shape of the cornea after surgery. Nowadays, new designs of Rigid Gas-Permeable Contact Lenses, may possibly used to overcome this difficulty. Weakened cornea which might rarely result in rupture or perforation of the cornea after a severe eye trauma. Infections of the cornea (infectious keratitis): although its occurrence is lower than that observed in contact lens wearers, it is considered the most common vision-threatening complication associated with radial keratotomy. 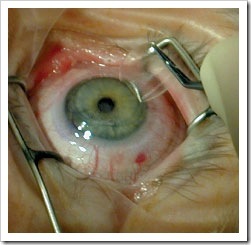 This might occur immediately after the surgery or later as the cornea continues to heal. As an alternative to LASIK, Radial Keratotomy does have a few advantages such as lack of corneal tissues loss and relatively low Cost. However, Radial Keratotomy is now limited to correction of low degrees of nearsightedness in patients who are not good candidates for laser refractive surgery. So if you are taking into consideration having surgery to improve myopia, consider the different alternatives available these days such as PRK, LASIK, LASEK and intraocular lens implants, and talk about them with your surgeon. Now you can watch a Radial Keratotomy Surgery Video to fully understand how Radial Keratotomy works. 1. Yanoff M, Duker JS,Augsburger JJ, et al. Ophthalmology. 3rd ed., Mosby; 2009. 2. Feder RS & Christopher JR. The LASIK Handbook: A Case-Based Approach, Lippincott Williams & Wilkins, 2007. 3. Mandelbaum S, McLeod SD et al. American Acad. Ophth. Preferred Practice Patterns, Refractive Errors, 2002.